I had this idea to make an illustration that shows how odontoceti (Toothed) whales evolved over time and looking at the changes in their skeleton, muscles, and fully restored form. I noticed when talking with my friends a lot of them didn't believe or know that there are many transitional fossils that prove evolution, so I always use whales as an example. So I made this study to help them better understand. Now, these aren't the only transitional forms, I just picked out seven to illustrate. So if there seems to be some jumps in their transition that's probably why. If you want to learn more on the process and many transitional forms I suggest Googling whale evolution. There's many sites and papers done on the subject that explain everything better than I ever could. So the first transitional fossil I chose is a little guy called pakicetus inachus. This early on they look nothing like a whale. They are small (At least compared to it's friends listed here!) land animals that were probably semi-aquatic.The inner ears of pakicetus are very interesting, they share the same characteristics only found in cetaceans. The large auditory bulla is formed only from the ectotympanic bone. It may seem like a tiny detail, but this is a big clue that links them to whales. Ambulocetus natans is the next transitional fossil I chose. They too have interesting ears since they seem to only work underwater. 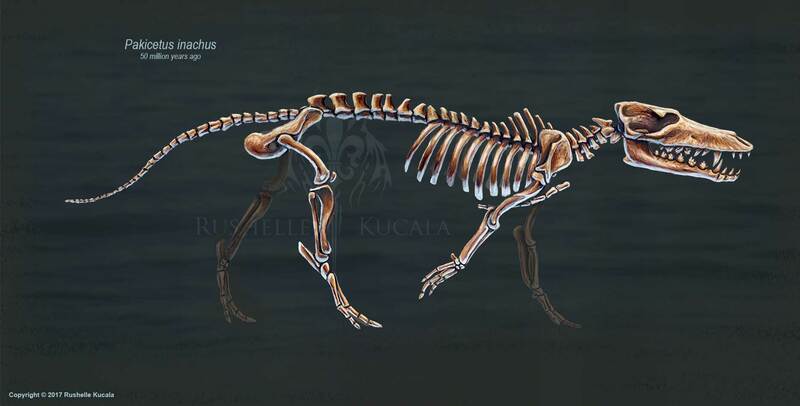 It’s still unknown if ambulocetus was semi-aquatic or fully aquatic, more than likely fully aquatic. It could also swallow underwater. Their teeth are also starting to look more whale-like. Fast forward a couple million years and we have maiacetus inuus. Notice how the legs are getting shorter, but the hands bigger and more for paddling. The nostrils are also moving further up on the skull. Their tail is also getting longer and stronger for swimming. 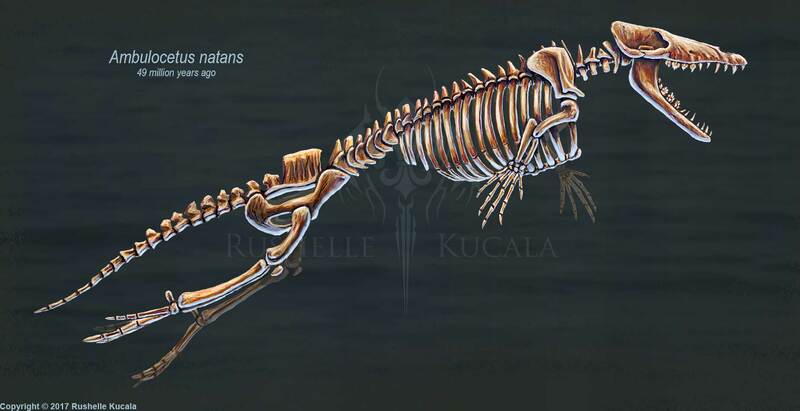 Maiacetus was mostly aquatic and probably only went on land to rest or give birth. Next up if rodhocetus kasrani. The legs are still getting shorter and more paddle-like feet. They had flexible spines which was great for swimming. They probably couldn't walk on land for too long due to the shape of their legs and feet, so they must have spent a majority of their time in the water. So the next transitional fossil is dorudon atrox. Now we're seeing a big shift towards the modern-day whale look that we know today. They are fully aquatic and excellent predators. Notice how they still have back feet, but they are now tiny and useless for walking. Next is basilosaurus cetoides. This big boy was once thought to be a marine reptile, but it was later on discovered to be a mammal. Hence why the name basilosaurus, with the "saurus" suffix. These animals were carnivores and probably had very strong bite force. And now we're finally at orcinus orca, AKA killer whale. These giants are apex predators, hunting a large variety of prey. They now have developed melons and now swim in pods, working together to hunt and for protection. You can really see the resemblance to it's ancestors just by looking at their skeletons. It was a joy reconstructing each animal and seeing how they transformed over the many, many years. It's truly amazing. I will be posting individual closeups of each skeleton over the next couple of weeks. I didn't want to post them all at once and bombard everyone's feed. So look forward to those! I am also working on my next study which is on their muscles, so look forward to that too.